I was going to mention these two new books in my June column, the new bibliographic list about spirituality which I posted yesterday, but they didn’t seem to fit the flow. And I didn’t want these to get lost in that long catalog. I’ll be brief. 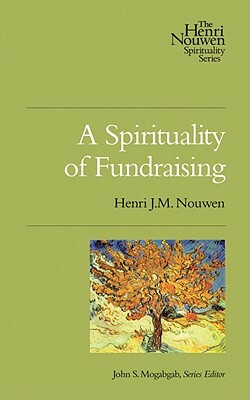 Nouwen fans will be delighted, though, to know that the Henri Nouwen Society and his Legacy Trust in England have allowed the Upper Room publishers to release a piece, A Spirituality of Fundraising, which they used to promote (for free, as a monograph, back in the day.) It was hard to get and rumor of it was legendary. That it is now widely available, handsomely designed and nicely produced is certainly great news. More on that in a moment. The Society and Trust have worked out a partnership with Upper Room to also release some other Nouwen writing, lifting things from his published and unpublished body of work. 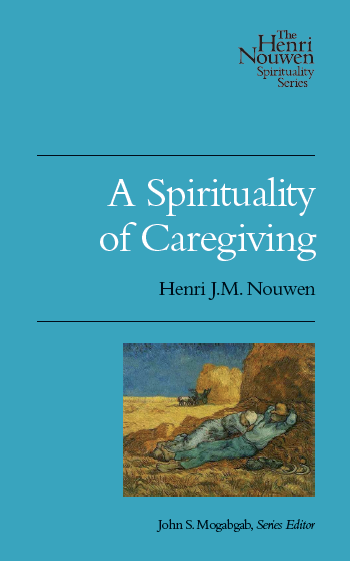 A Spirituality of Caregiving is the first of this sort, not entirely new, but newly compiled and formatted — including some previously unreleased work from his manuscript archives. This is so, so exciting, and we are just thrilled to announce this here at BookNotes. I am sure you know about Father Nouwen’s move to be a member of the L’Arche Daybreak community, and the last ten years of his life lived with the mentally challanged. He soon came to understand that faithful caring involved mutuality, a “mutual spiritual presence” and that as we grow to love others, we can experience inner healing, liberation, growth, transformation and the like. Some of these insights, about the ups and downs of taking care of others (to put it more prosaically than he does) are found here, woven together nicely as a coherent, lovely little book. I can’t say enough about this great resource, and we wouldn’t be surprised if it is adopted for use in Stephen’s Ministry classes, for deacons, nursing home staff, hospice workers, counselors of at risk-youth, and anyone working with the sick. Perhaps you must live the 36-hour day of those living with a loved one with dementia. Perhaps you are caring for someone with chronic pain. And, I bet you know somebody who would be blessed to receive this handsome little book. A Spirituality of Fundraising Henri J.M. Nouwen (Upper Room Books) $12.00 Like the previously mentioned one, this is one of the most handsome little volumes I’ve seen, with lovely pull quotes, b/w art, nice type, a fully lovely version of what was once a fairly plain booklet. Like its companion, it includes Nouwen writings that few have ever seen before. This is wonderful news, and its genesis is itself a bit of a grace. The booklet was written up from a (serendipitously tape- recorded) lecture Nouwen gave to a mission group he believed in. He was fired up for the Kingdom of God and invite them to be bold in asking for money. He knew it was nothing to be ashamed of, but an invitation for people to join together in God’s work, a great opportunity, not a begrudging hassle. And he knew it took not only convictions about the importance of the work, but vulnerability and trust. This has been the key to any number of para-church ministries and a good reminder to those (like my friends at the CCO or IVCF) who have to raise their own salaries, or any number of non-profits who are always needing to raise additional funds. Father Nouwen speaks great truth here, passionate words about God’s mission, about giving, about trust, about generosity. You may think (if you are not a fundraiser) that this book isn’t for you, but since we all live in a world of economics and budgets, and we all give donations and steward our resources, it could be said that this little book is essential. What an urgent topic and what a rare bit of deeply spiritual wisdom. Church leaders especially need to know this, need to get these truths into their bones. Money follows mission; donors are partners, not objects. Development is ministry, not only a tool of ministry. Our esteem does not come from our success; we are to be people of gratitude, always. I hope you help us spread the word about this great little treasure. God’s reign calls us to be givers. And sometimes fundraisers. This helps us understand it well. I love this opening story from the preface of these two handsome books. Henri Nouwen sought the center of things. Never content to observe life from the sidelines, his approach to new experiences and relationship was full throttle. He looked at the world with the enthusiastic anticipation of a child, convinced that right in the midst of life he would find the God who loves us without conditions. Helping us recognize this God in the very fabric of our lives was the enduring passion of Henri’s life and ministry. Thanks to Nouwen’s old teaching and editorial assistant (while at Yale), and founder of the Weavings journal, John Mogabgab, we have this great new series now available as books, with more to come. We are pleased to name them now, as additions to the list of the summer’s best new books on spirituality. Hooray!! Please send me a copy of each of the Nouwen books.